When you're next making a purchase online, make sure you do it via our easyFundraising page - and make a free donation to the club in the process! And to make sure you never miss an opportunity to donate, you can also download the easyFundraising toolbar. 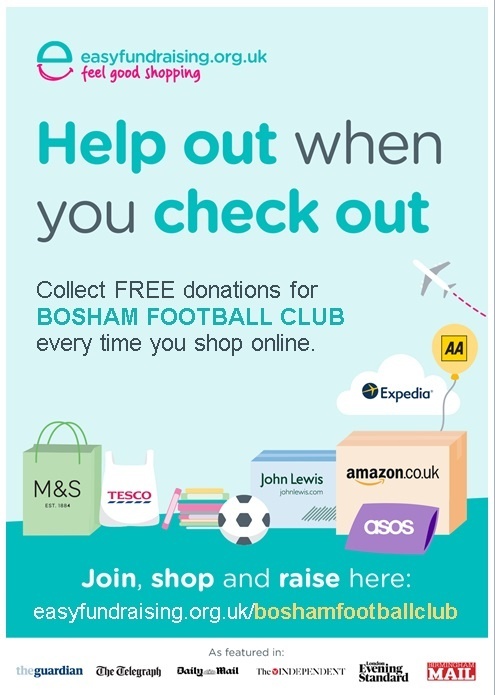 So far Bosham Football Club has raised over £350 through easyFundraising - it's a really simple - and free - way to help us out if you're going to be buying online. Larger donations are made for utility switching, insurance renewals or holiday bookings. Starting a mobile phone contract with 02 nets a £45 donation; while joining either Sky or BT Broadband (via the easyFundraising links) is worth £40. So do please think of us, and spread the word!